Home A Writer's Life Magical Menageries #5: Equus is Now Available! 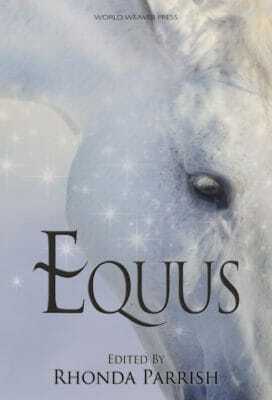 Magical Menageries #5: Equus is Now Available! I love my story, “To Ride a Steel Horse,” included in this anthology. On the face of it, you might think Demy is someone I don’t have much in common with: she’s a mathematician and a witch and bisexual, and I loathe math, can’t do the first bit of magic, and am straight aromantic. But really, we have a lot in common: we both want freedom, we both love our Indiana home, and we’re both utterly horse-crazy. I haven’t read the other stories in this anthology, with the exception of Laura VanArendonk Baugh’s story “Rue the Day,” but I have a lot of faith in Rhonda Parrish as an anthologist. She has a unique talent for choosing stories that blend well together and finding the perfect order for those stories. I’m also a fan of a lot of the writers who are included in this anthology. I’m thrilled to get to be a part of this anthology and this group of fantastic writers. Featuring nineteen fantastic stories of equines both real and imagined by J.G. Formato, Diana Hurlburt, Tamsin Showbrook, M.L.D Curelas, Laura VanArendonk Baugh, VF LeSann, Dan Koboldt, J.J. Roth, Susan MacGregor, Pat Flewwelling, Angela Rega, Michael Leonberger, Sandra Wickham, Stephanie A. Cain, Cat McDonald, Andrew Bourelle, Chadwick Ginther, K.T. Ivanrest, and Jane Yolen.